The purse and accessories maker saw positive momentum in both its top and bottom lines, but is it too soon to call the rebound effort a success? 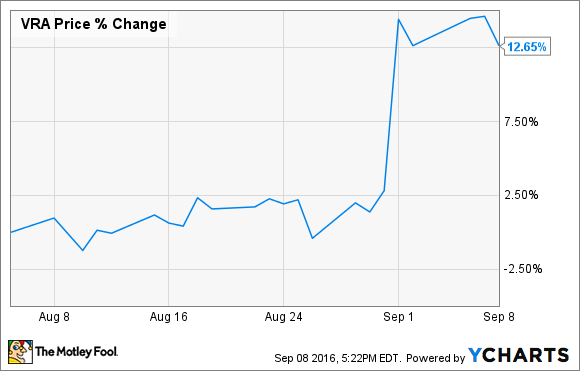 Vera Bradley (NASDAQ:VRA) released its fiscal 2017 second quarter earnings on Sept. 1, and its stock is up double digits since the report. What happened during the last quarter to generate such optimism among investors, and what is the company's outlook going forward? The company reported revenue of $119.2 million and profits, as measured by earnings per share, of $0.14 -- both in line with stated expectations from last quarter. Those numbers were down annually by 1.2% and 6.7%, respectively. However, through the first half of 2016, revenue and profit are up about 1% and 33% year-over-year as the company continues its rebranding and transformation efforts. And keep in mind that new store openings drove the bulk of those gains. Over the past 12 months, six full-line and seven outlet stores opened. Profit was also helped by a decrease in cost of sales and lower interest expense, while comparable sales struggled. The company again reported persistent difficulties with the current retail environment. Decreasing foot traffic at shopping malls has been a problem for traditional retailers for the last few years, but Vera Bradley also notched a decrease in sales from their online store. In-store comparable sales fell 5.1% year-over-year, and e-commerce comparables fell 8.1%, combining for a total comps decline of 6.1%. Vera Bradley cited some of the weakness coming from less promotional and sales activity compared with last year, something the company has stated would happen going forward as part of its rebranding. Those declines are troubling and indicate the company's makeover efforts have yet to take hold. The stock seems to have risen in spite of the numbers, though, as investors feel optimistic now that the bulk of rebranding efforts are under way. However, it is especially troubling that declines are occurring from online sales. E-commerce has been notching gains of about 14% per year, so Vera Bradley needs to ramp up efforts in that department if it wants to keep up with competition. What does the company's roadmap for recovery look like through the end of the year? For full-year fiscal 2017, sales should come in 2% to 8% higher than last year, and earnings per share 7% to 12% higher. Though the business has been dragging slightly in the summer months, company management feels positive about the new strategy despite the continued headwinds. So what exactly is in the works that could help Vera Bradley during the final half of 2016? One of the main objectives for the company this year was to complete its brand transformation. The final steps are being put into place during the current quarter. Management sees these changes laying the foundation for future growth, including comparable-sales, by the end of the year. New licensing opportunities were also announced for the company's stationery and publishing lines with more announcements expected through the end of the year. To complement all of the new changes and revamping, a new ad campaign with extra emphasis on a social media presence and outreach is under way. The company's flagship store in the SoHo neighborhood of New York City recently opened its doors, featuring the new logo and fashion lines. Refreshing other full-line stores will also continue through the quarter, with an emphasis on bringing them up to speed with the new design elements. The refreshed verabradley.com online store has also made its debut. The store features easier search and navigation, new payment options, the "order online, pick up in store" option, and the ability to expand internationally. All of these company redesigns are aimed at showing off the new styles, including handbags, travel luggage, and home accessories. As of now, these offerings have failed to boost comparable sales, but the holiday shopping season is right around the corner. Investors will get the opportunity to see if all of the strategic changes come together or fall flat with shoppers. Vera Bradley delivered on expectations during the last quarter, leading to a jump in the share price. Revenue and profits showed modest growth, but with much of that coming from new store openings, it still remains to be seen if the turnaround strategy is working. In the quarters ahead, investors should be looking for signs of comparable sales growth making a reversal. In today's marketplace, with internet sales continuing to gain ground on traditional store formats, it will be especially important to see the new website and e-commerce growth turn positive. Until that happens, it is hard to get too excited about this stock. I'm taking a wait-and-see approach.